Mabtools power grind discs have been designed and manufactured to provide the best snagging performances on ferrous metals, steel, stainless steel, aluminium and non-ferrous metals. Power range has been designed to be versatile, paying particular attention to materials and applications. Discs are manufactured using top quality European raw materials, corundum and silicon carbide, mixed with resin bonds and special fillers. The fiberglass reinforce nets are selected for their quality and strength, resulting in maximum safety when using the disc. 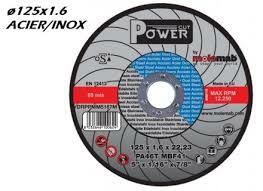 The main feature of power grind discs is the high stock removal. This allowa better performances during the most common snagging operations even on large surfaces.